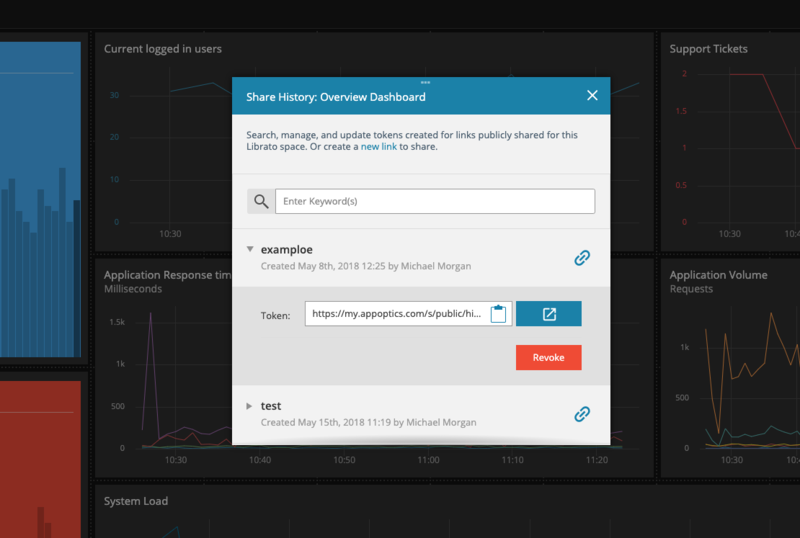 If you want to share dashboards with customers, friends or colleagues that don’t necessarily need access to your entire AppOptics account you can use the share feature. This feature allows you to create and manage multiple private links for each and every dashboard in your account. On any dashboard you want to share, just click on the share icon in the menu bar. 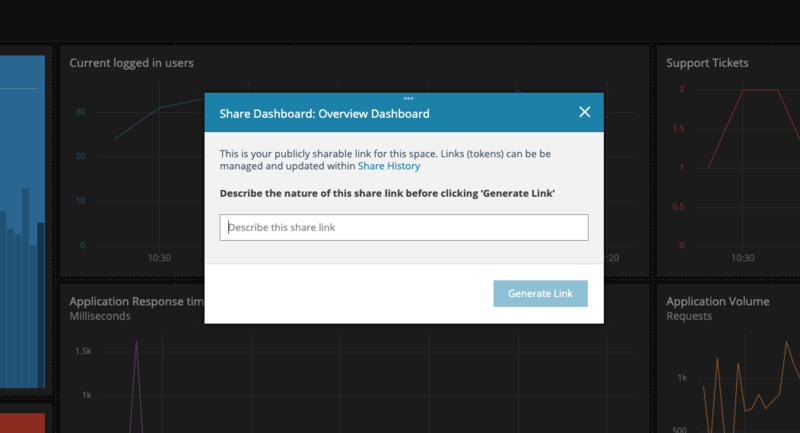 This brings up the Share Dashboard button and - if you have already shared this dashboard before - the Share History button. When you click on the Share Dahboard button it brings up a modal window that asks you to name the link. This is useful to keep track of what you used the link for. Another very useful feature is that you can select to lock the dynamic tags to a specific tag set. If you don’t set a dynamic tag then the shared dashboard will present an aggregate of all streams associated with the metric. In the example above we are filtering on the @host tag. Clicking on Generate Link generates a private, read-only link to a dashboard that locks in that tag definition. The link opens the dashboard in read-only mode without any need to log into your AppOptics account. Read-only dashbaord live-update and allow the user to change the time frame using the datepicker. Users will not be able to add/remove/reorder the charts on the dashboard. Clicking on the Share History button takes you to a list of all the links that have ever been created for the dashboard. In this modal window you will be able to copy the link, see what tag set was used, and revoke the link. If the link was revoked it will show a red link icon. Aside from allowing you to safely share curated visualizations more broadly this feature is also really useful if you want to load a dashboard on public wall-mounted displays without having to log in to an account. As a final added bonus, read-only dashboard are super-easy to load on an iPhone and iPad!